Say hello to Rocco! 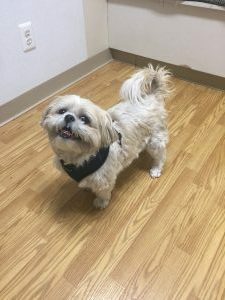 Rocco here is a handsome little shih tzu that was having a horrible time with his front right leg. The little guy just could not get comfortable. He was limping, lame, and really not wanting to use that leg at all. His tail was tucked and his back started to hunch. Soon his back legs started to wobble and his gait was completely off. Being familiar with chiropractic herself, Rocco’s mom found us and gave us a call to bring him in! Rocco was an absolute gem and a gentleman. Though a little nervous and showing signs of discomfort, he was able to be adjusted from head to tail. Within his first adjustment his back had already started to flatten and his limp was not nearly as bad. What a difference in such a short period of time! Now Rocco’s issues were a little more difficult because he had this habit of pushing himself to the limit when he was feeling good….so naturally he continued to reinjure himself time after time. Luckily his fur parents were very diligent and they iced him religiously as well as got him adjusted weekly for a period of time. Two months after starting care, Rocco has made a complete recovery. He can play with his sister, he can jump, run, and tumble and is no worse for the wear. He continues to get adjusted once a month to maintain his progress and prevent a relapse. Rocco is a doll and we hope his story will give some hope to all those with a limp that just won’t resolve! Check out Gordon! 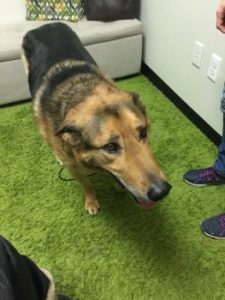 He is a rescued shepherd that caught our hearts the moment we met him. He is an absolute Velcro dog and thinks he is only ten pounds. When Gordon started limping horribly, his fur mom was very concerned. It got to the point where within a few days Gordon wasn’t weight bearing hardly at all in his one front leg. His limp was horrible and he wasn’t getting up without help and didn’t come to greet mom at the door when she came home. The veterinarian couldn’t tell what was wrong and said they’d need an MRI and possibly surgery. Not wanting to go that route unless there were no other options, Gordon’s mom gave us a call first. Gordon waltzed in non weight bearing on the one front leg and was in complete spasm throughout his neck. Upon further investigation, Gordon had always been a big puller on his lead. This had lead to a significant pinched nerve at the base of his neck. After his first adjustment, Gordon began to weight bear about fifty percent of the time. Within three adjustments Gordon’s gait had completely resolved and he wasn’t limping any longer. He was getting up and greeting mom at the door and even running on his walks. His energy was back and overall he felt amazing again. All of this without ever having to go under the knife! Sometimes the simplest solutions are the ones we tend to ignore, we are so glad Gordon’s mom didn’t! To watch a before and after video of Gordon- click here! This handsome fellow is Trumbull. 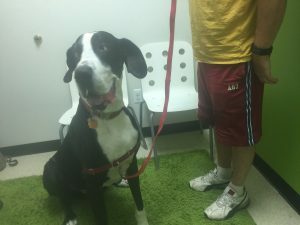 He is a senior great dane that has been dealing with an unsteady gait. On occasion his front paws will knuckle under when he’s walking which will cause him to trip on himself and go down. Now when you’re a big great dane that little trip is a big deal. His fur parents are very in tune with their gentle giant, and figured chiropractic might be a good option in addition to his monthly massages. On his first visit we could see how uncomfortable Trumbull was. He’s a big boy with a not so little-sister, another dane that loves to play. Being in his senior years, Trumbull cannot handle excessive play like he once did. He had multiple areas that were arthritic and also minor pinched nerves throughout his neck, which is why his paw would knuckle under in exaggerated form. Trumbull gets adjusted at least once, sometimes twice each month, to keep everything moving as well as it can. He still knuckles on occasion but over the past couple of years he has maintained a wonderful quality of life. He moves smoothly and has a pep in his step, something that makes us very happy. We love Trumbull and are ecstatic we’ve been able to help him through these last couple years! 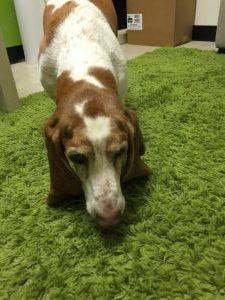 Meet Vegas- a sassy and loving basset hound in the prime of her senior years. Not only is Vegas one cute number, she is also blind and partially hard of hearing. She’s been running into walls and bouncing off of them practically her entire life. Needless to say this unintentional reckless behavior did a number on her spine. Vegas woke up one day in excruciating pain, she was screaming and crying and her parents had no clue what was going on. At the vet’s office, they were given pain medication and steroids to give their girl, neither of which seemed to help at all. Vegas couldn’t lift her head and turning from side to side was out of the question. When she would lie down she would have to flop over because she had no stability or way of containing herself. Getting up was an entirely different animal. On her first visit Vegas was struggling to just walk to the exam room because of her lack of mobility. She was in complete spasm in her neck region and severe pain. Within one adjustment Vegas was already showing steady signs of improvement. She could turn her head side to side and lift it beyond her shoulders. She didn’t cry out upon palpation of her neck and the spasm was negligible. Within her next two adjustments Vegas was back at her puppy antics, playing games and running around with energy. Her neck issue had resolved and her inflammation was down without any need for pain medication, etc. Sometimes a pinched nerve rears its ugly head and when you relieve the pressure on the spinal cord and the nerve roots, everything resolves in a nice natural fashion! 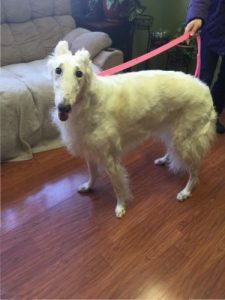 Meet Vera the Borzoi. She is astoundingly beautiful and graceful at the same time. Vera has never been one to complain, and she always does her best for her mom. One morning, she woke up with extreme neck pain. She was hesitant to get up, put weight on her front left leg, and didn’t want to walk very far. Her fur mom and the vet couldn’t seem to find anything outwardly going on with her forelimbs or her neck. 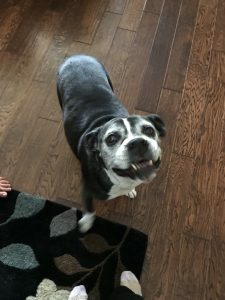 Intuitively, her fur mama knew something was up, and when the vet suggested chiropractic may help to resolve the issue, she jumped right on board. On her first visit Vera did not want to put much weight on her front left leg. Interestingly enough, her leg had absolutely nothing going on that would cause this behavior. Upon further examination, Vera’s neck was a big mess. She could hardly turn her head to the left and was carrying it in a very stiff manner. Getting through the muscle spasm we could see something had shifted in her lower cervical spine that was impinging on the nerves here, thus causing the radiation down her front leg. Gently, Vera got adjusted, and within the day she was using her front leg and turning her head. At her second visit she was so close to normal it was uncanny. Though it took several adjustments to fully relieve the pressure on the nerves, she managed to make a full recovery. Vera continues to come in monthly to help maintain her progress while also protecting her from other structural shifts that might take place due to her activity. Once in a blue moon she feels so great she will bolt down the stairs, and sometimes this can aggravate other areas in her spine. Luckily we are here to put her back together so she can go make new mistakes!